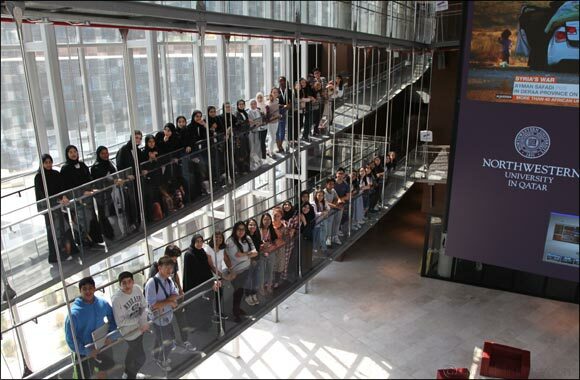 Doha, Qatar – July 9, 2018 – More than 75 high-school students spent part of their summer break exploring the world of media, news, and filmmaking at Northwestern University in Qatar (NU-Q). The annual summer program, which is designed to give 15 to 18-year-olds a chance to sample life as a Northwestern student, saw the highest turn-out of participants to-date with 17 nationalities represented, including a record number of international students who flew in to take part. The programs were led by NU-Q Journalism Professor Miriam Berg and Communication Professor Rana Kazkaz. Throughout the two-week program, participants took courses on news creation, journalistic photography, news production, storytelling and filmmaking. They also were able to put the theories they learned in class to test by creating and presenting their own news reports, documentaries, and short films. “This program, which is media-centric, encourages them to explore new areas of learning in a setting that is similar to what they will experience as undergraduates in college. It is also an opportunity to discover new passions and opportunities,” said Everette E. Dennis, dean and CEO. NU-Q’s high-tech facilities, including the fully-automated Newsroom, editing labs, and production studios were also available for the students to explore and use.